The sun had escaped down the horizon as we boarded a jeepney bound for Picnic Grove in Tagaytay. We snuggled tightly as it sped past the city rotunda, the chilly evening air wafting through the open windows, and zipped through the now dark highway. We were off to our gang’s Christmas party of sorts. 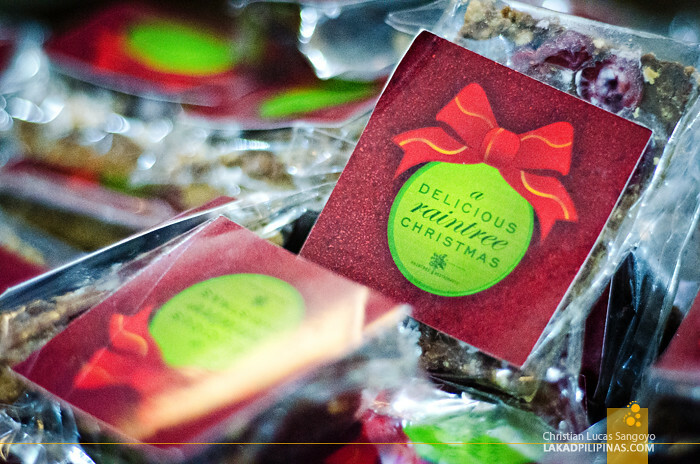 We were headed to Estancia Tagaytay. 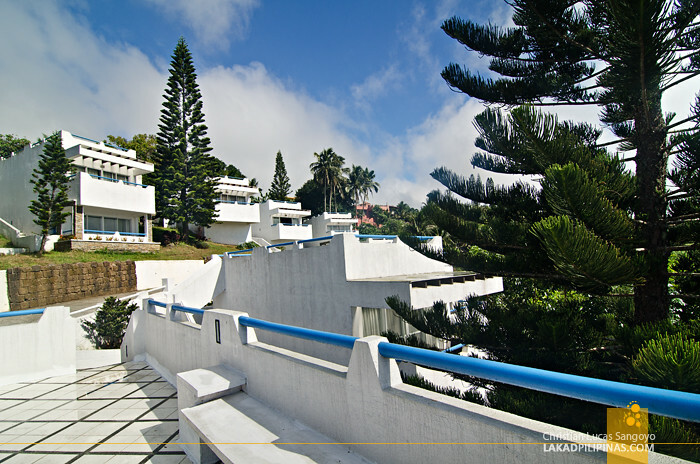 Located on the scenic Tagaytay ridge, the hotel follows the slope of the land. 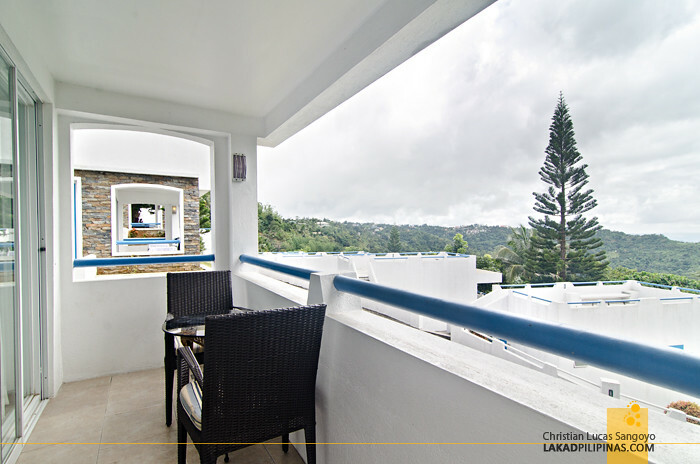 From the receiving area, we took an elevator one level down to Estancia’s main lobby. 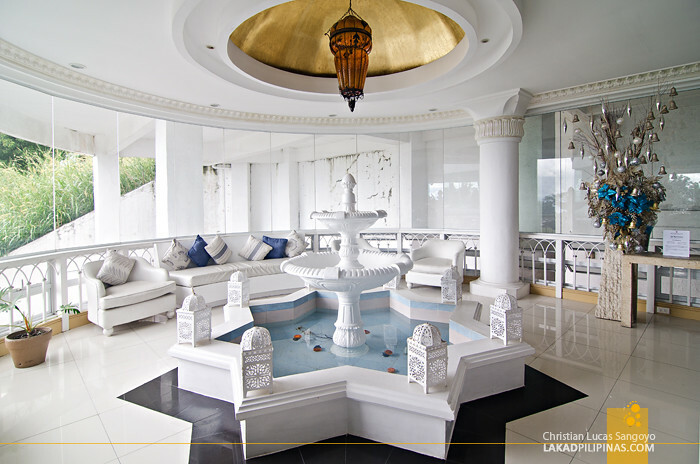 The Mediterranean theme is immediately evident, white walls and columns with subtle blue highlights (quite reminiscent of our Thunderbird La Union stay). We then went further down through a maze of hallways, through a garden path, past a lighted swimming pool and onto a golf cart that slowly putt-putted to our homes for the night. 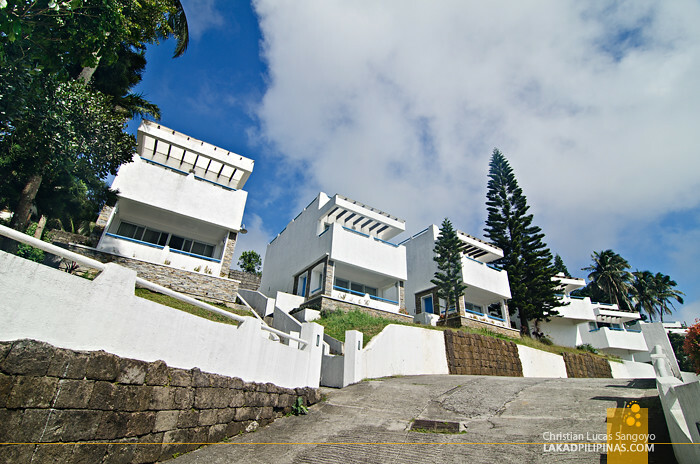 Estancia in Tagaytay is huge. 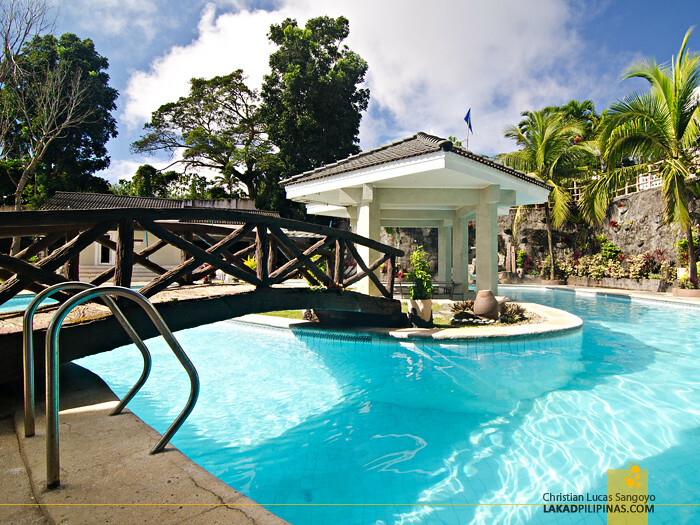 The resort is actually subdivided into three main areas (as far as I can tell). 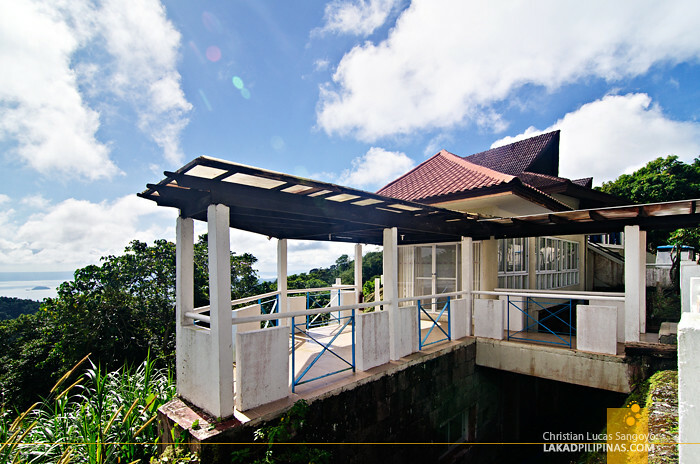 The main building where the lobby and restaurant are located, the rustic casitas facing the Taal Lake view and the Santorini-inspired cluster which also faces Taal. The Greek cluster looks to be the newest and best of the three. A single Santorini structure typically houses two rooms, one on each floor, and both are good for two persons. We were booked on the upper floor on a double-bed room. 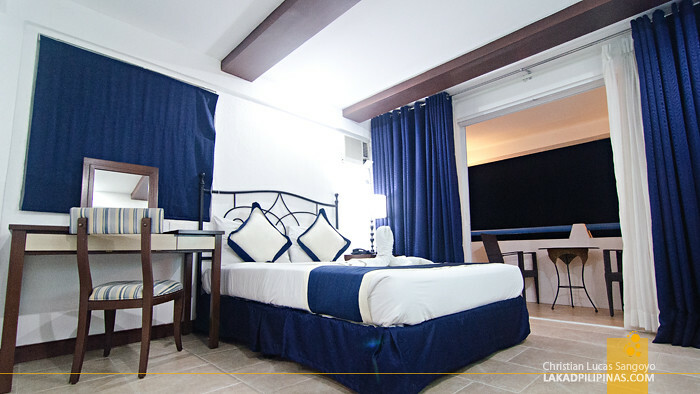 As expected, everything is set in Mediterranean themes, whitewashed walls broken by blue fabrics and wooden trims [CHECK ROOM RATES & AVAILABILITY]. 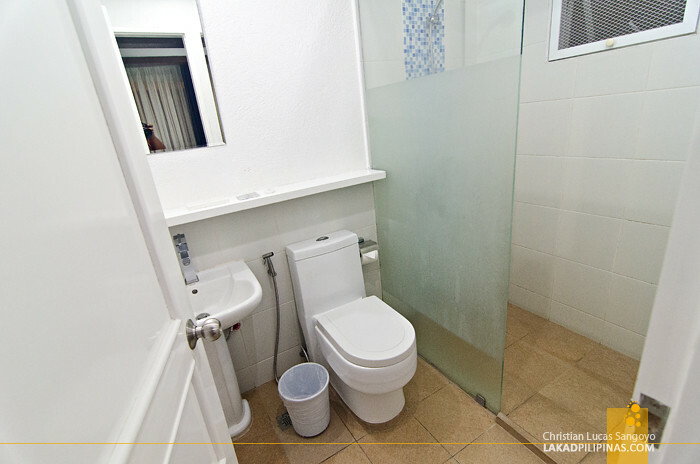 CLEAN AND SIMPLE TOILET AND BATH—IT HAS A BIDET! Although the furnishing seems a tad dated, the room is quite spacious and well-maintained. It has an en suite toilet and bath with hot water, cable television (not flat-screen though), air-conditioning which we almost didn’t use since it was quite cold in Tagaytay at the time, a mini-bar with coffee and tea-making facilities (you’d have to purchase your instant coffer or tea though, which I find quite weird) and a balcony with a majestic view of the Taal Lake. 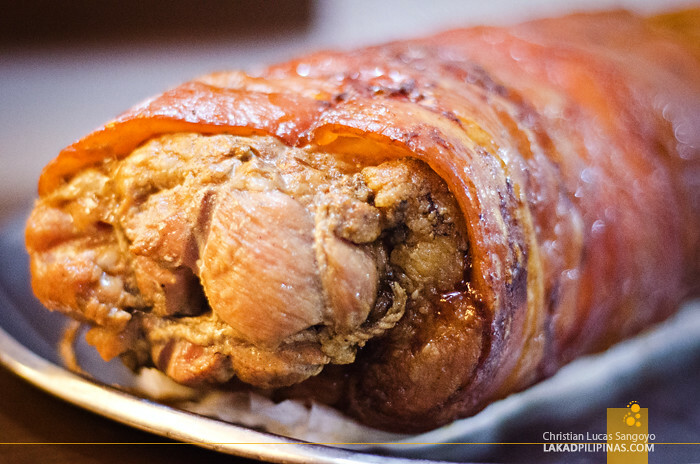 CEBU’S ORIGINAL LECHON BELLY FOR THE WIN! 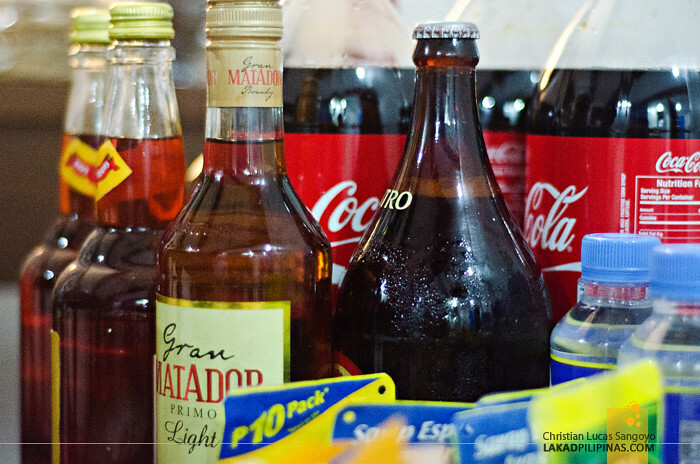 Converging on Lakwatserong Tsinelas’ room, which was more than large enough for the eight of us, we brought in a huge slab of Cebu’s Original Lechon Belly, some sweets we picked up from Kabila Restaurant and bottles of Red Horse, Gran Matador and Tanduay. We were here to really rock the house and party until the wee hours of the morning. Surprisingly, the next day found us quite early. 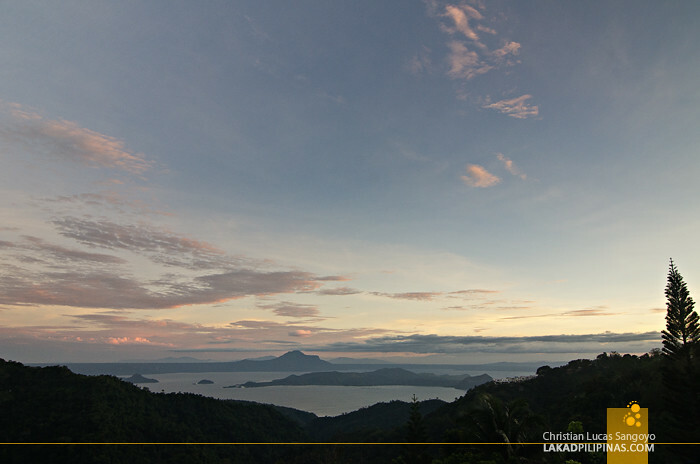 With no real call-time, we caught each other trying to outbeat each one to a sunrise Instagram photo of Taal Lake. Talk about competitive, lol. 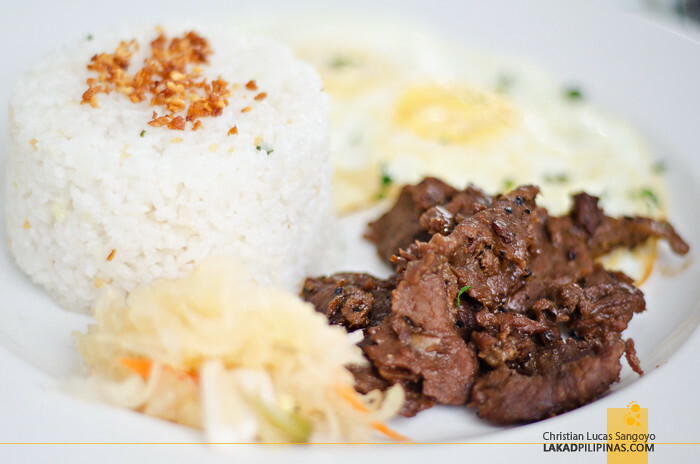 We then raced to Estancia’s in-house restaurant, not just for our complimentary breakfast, but also to upload our IG’s, haha. Internet and cellular connection is a bit weak on the Santorini cluster, unfortunately. 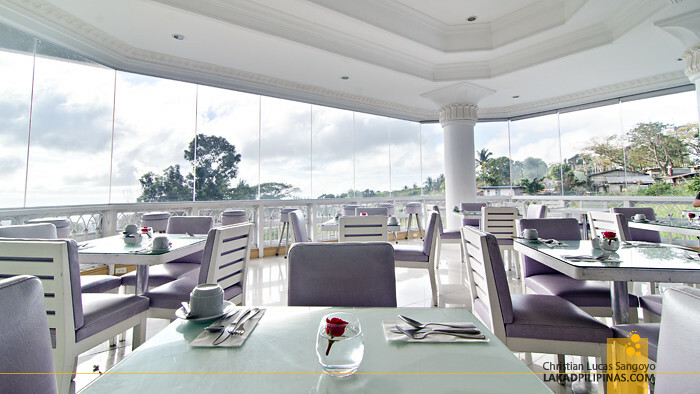 Estancia Tagaytay doesn’t serve buffet breakfast for guests, but they do serve a mean set of meals. 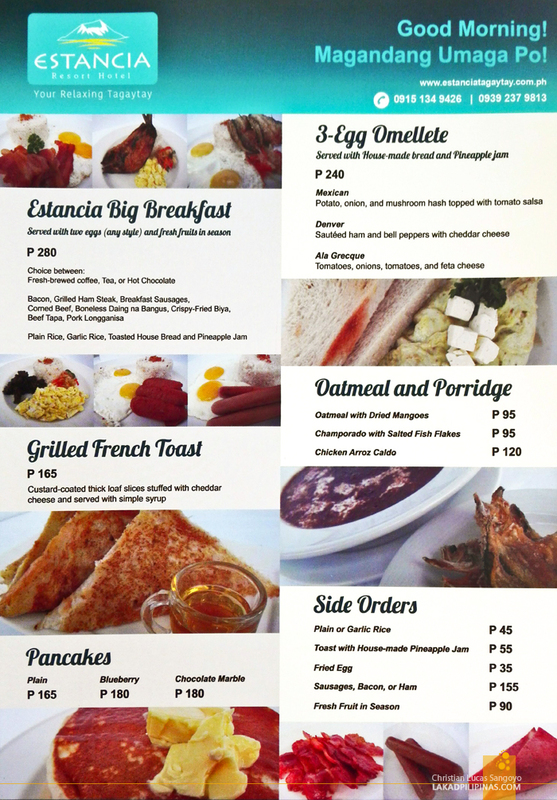 They have Big Breakfast (basically, their silogs), Grilled French Toast sets, Pancakes, 3-Egg Omellets and Oatmeal & Porridges [CHECK FULL MENU]. We all asked for variations of their silogs and it didn’t disappoint. 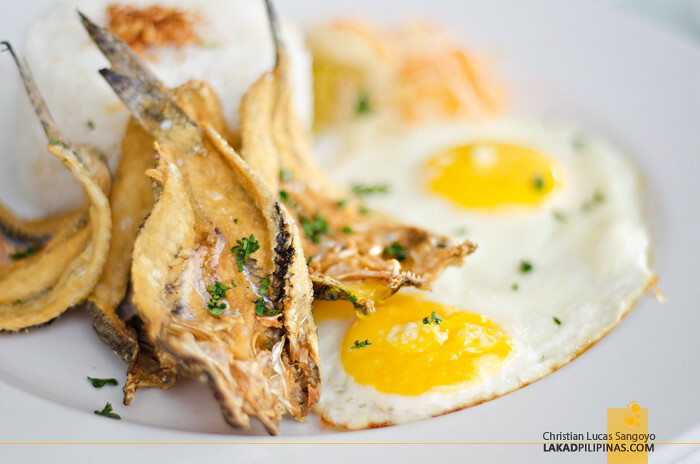 I had tapsilog, which has really good and tender meat, but I wished I ordered their biyasilog instead which is served with crispy fried biya—a freshwater goby fish found only in Taal Lake. The next few hours found us roaming around the grounds of Estancia, the gang doing their best to have a selfie at each and every corner of the resort and failing miserably; the resort is really quite huge. We thought of dipping on the pool, but the weather was really just too chilly. And so we did the next best thing. We all went over to Elal’s room with all the left-over lechon and alcohol, turned on the TV and tuned in to PBO where we caught a run of Four Sisters and a Wedding. I’m really not a fan of contemporary Filipino Cinema, but it was quite fun watching it with TeamRH in a single room with all the side-comments, unstoppable sobbing and all, haha. By the end of the film, I called the guys out to the balcony; the sky has transformed into soft pastels. We watched, took photos and watched some more, both in awed silence and gleeful giggles. 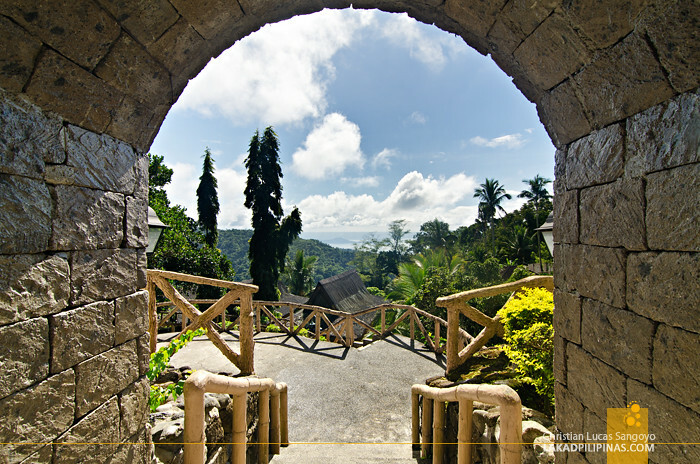 The scene was breathtaking; indeed, the perfect way to end the team’s year of travels and staycations. 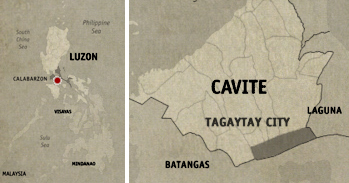 But enough of the melodramas, it’s time for Tagaytay’s famous bulalo!